Water is of central importance to humanity and among the earth’s most precious resources. Because water is integral to all life processes, there are no alternatives that can substitute for it, and water affects every aspect of human existence. Consequently, civilizations have flourished where abundant, high quality fresh water was available. Although the North American continent is generally favorably blessed with aquatic resources, these resources are unequally distributed and concerns are growing about the long term supply of water to support economic development in many parts of the continent. The protection and wise use of existing water resources is essential for continued ecological and economic health of any region. 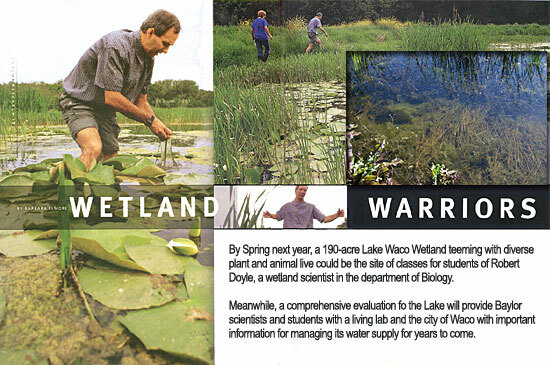 Baylor University has many faculty members in various academic departments whose research focuses in whole or in part on various aspects of aquatic science. Faculty expertise exists in primary productivity of aquatic ecosystems, aquatic toxicology, aquatic ecology, surface water hydrology, groundwater, wetlands, ecosystem modeling, nutrient cycling, stream erosion, sedimentation of reservoirs, water analysis, aquatic chemistry, hydrologic modeling and aquatic biology. In addition to these strengths in basic and applied science, Baylor University has expertise in environmental economics within the Hankamer School of Business. For more information on the Center, contact Robert_Doyle@baylor.edu.